The answer: Because they are doing different jobs. 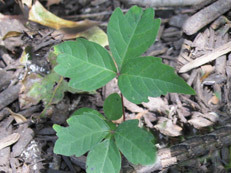 The baby leaves of a poison ivy seedling growing in its first year. 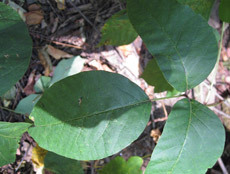 The edges of the leaves are toothed and terminal leaf has short neck. 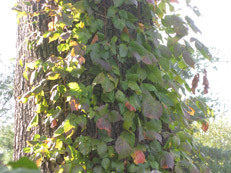 Toothing of leaves facilitates good water evaporation which leads to quick growth. The short neck enables conservation of plant tissue and allows for complete and coordinated movement of the three leaflets together to better determine and note the sun’s path. 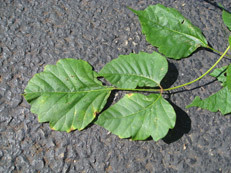 This leaf from a sexually mature vine is in its finest prom clothes, complete with sleek, untoothed leaves, which conserve water and give it a stylish, finished look for others to admire (from afar). It’s back to the office with this post-mature, ‘casual dress’ look which combines the best of water use and conservation, tooth leaves and a loose, rugged leaf texture and style. Another post-mature gaggle of competing runners climbs a large oak tree. Just beginning its red and orange fall color, these various leaves exhibit a wide range of shapes, types and styles, showcasing the plant’s wide range of leaf possibilities, but all still “leaves of three that look like me”. Thanks, Umar, photos helpful in identifying pi. I’ll have a look at my grounds, now!